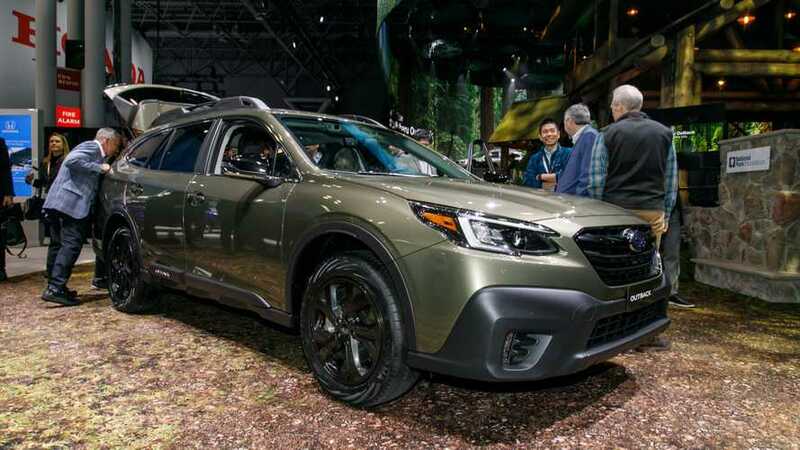 The 2020 Subaru Outback arrives at the New York Auto Show to reveal the sixth generation of the brand's mashup between a station wagon and a crossover. Sales start this fall in Base, Premium, Limited, Touring, Onyx Edition XT, Limited XT, and Touring XT trim levels. Like its sibling, the Subaru Legacy, the new Outback's XT trims come with a 2.4-liter turbocharged engine with 260 horsepower (194 kilowatts) and 277 pound-feet (376 Newton-meters) of torque. Other models get a 2.5-liter naturally aspirated four-cylinder with 182 hp (136 kW) and 176 lb-ft (239 Nm) of torque. Both mills hook up to CVT and torque-vectoring all-wheel drive. The new Outback now rides on the Subaru Global Platform. The company boasts that the new underpinnings allow for a 70-percent boost in torsional rigidity. It can also absorb 40 percent more energy in a front or side collision. In addition, Subaru's Eyesight safety suite is standard on all trims, including adaptive cruise control. From the outside, the new Outback looks very familiar. Despite moving to the Subaru Global Platform, the sixth-generation model doesn't appear significantly different from the current one. The most visible tweaks to the front are the vertically oriented fog lights and more chiseled styling for the headlights. The changes at the rear are a bit more noticeable because of the larger roof spoiler, pointier taillights, and bulkier appearance for the bumper. The new Onyx Edition gives the Outback a darker look by dressing the exterior in black trim, dark-finished 18-inch wheels, and a two-tone gray interior. For a better time away from the pavement, a water-repellent material covers the seats, and there's a two-mode version of the X-Mode off-roading system, instead of the usual single setting, that offers dirt/snow and deep snow/mud settings. 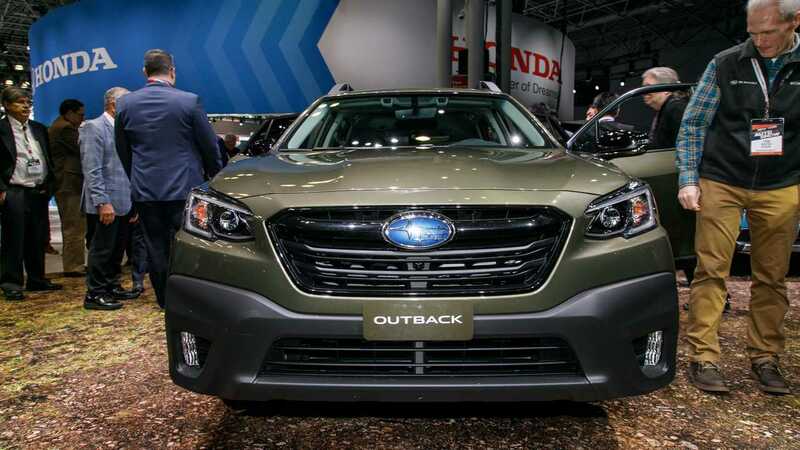 New York, NY – April 17, 2019 – Subaru of America today introduced the all-new 2020 Outback offering the most advanced features, design and capability in its history. The sixth-generation SUV comes standard with Symmetrical All-Wheel Drive and Subaru’s award-winning EyeSight Driver Assist Technology. With an available tablet-style 11.6-inch SUBARU STARLINKTM Multimedia system with integrated center information display, DriverFocusTM Distraction Mitigation System and new XT models with 260 horsepower, the 2020 Outback delivers greater technology, safety and performance than ever before. The 2020 Outback delivers the optimal blend of SUV capability and car-like ride and handling with standard Subaru Symmetrical All-Wheel Drive, Active Torque Vectoring, Vehicle Dynamics Control and X-MODE with Hill Descent Control. Ground clearance of 8.7 inches for all Outback models is greater than that in many SUVs, yet the Outback maintains a comfortably low step-in height for both front and rear passenger entry. All 2020 Outback models are paired with a Lineartronic CVT featuring an 8-speed manual mode function with steering wheel paddle shifters. The 2.4-liter turbo delivers a 3,500-lb. towing capacity, the most of any Outback in history, while the 2.5-liter provides more than a 600-mile range on a single tank. Manufacturer’s estimated fuel economy is 26/33 mpg city/highway for the 2.5-liter and 23/30 mpg city/highway for the turbo. Complementing the more refined powertrains is an all-new suspension that is lighter and more responsive. The front suspension utilizes MacPherson struts with new internal rebound spring, aluminum lower L-arms and new 23mm hollow stabilizer bar. The rear suspension renders a double- wishbone layout with subframe, coil springs and new 19mm hollow stabilizer bar. Introduced for 2017, the Subaru Global Platform has been optimized for the Outback, boasting a structure that is 70-percent stiffer in both torsional and front-suspension rigidity and 100-percent stiffer in both front lateral flexural and rear subframe rigidity compared to the previous Outback’s platform. Crash protection is improved, as the new body absorbs over 40-percent more energy in front/side crashes than the current model. When a crash is unavoidable, the Outback protects with eight standard airbags, including a driver knee airbag. Subaru expects the Outback to achieve top safety scores when it is tested later this year, including a Top Safety Pick+ rating from the Insurance Institute for Highway Safety (IIHS). Standard on all trims is Subaru’s EyeSight Driver Assist Technology that now includes Advanced Adaptive Cruise Control with Lane Centering, which provides steering assist when the vehicle veers outside its lane, helping the driver maintain a direct path. Segment-exclusive DriverFocus Distraction Mitigation System uses a dedicated infrared camera and facial recognition technology to identify signs of driver fatigue or distraction and provides audio and visual warnings to alert the driver and passengers. Additional available driver-assist technologies include LED Steering Responsive Headlamps; Reverse Automatic Braking; Blind Spot Detection with Lane Change Assist and Rear Cross Traffic Alert; and EyeSight Assist Monitor with head-up display. In another Outback first, the 2020 model offers a Front View Monitor, which captures images within the driver’s blind spots in front of the vehicle and displays a 180-degree view on the 11.6-inch display, providing safety and assistance when checking road conditions ahead or parking. The new 2020 Onyx Edition XT features black-finish exterior elements, 18-inch alloy wheels and badging, and an exclusive gray two-tone interior. Further, the seats are wrapped in a new water- repellant durable StarTex material. The Onyx Edition XT builds on the Premium trim and adds the 2.4-liter turbo BOXER, Hands-Free Power Gate, Front View Monitor and, for increased capability in a wider range of environmental conditions, exclusive Dual-Mode X-MODE and full-size spare tire. Following a “Dynamic x Solid” philosophy, the all-new Outback is anchored to an “Active x Tough” concept. The result is a rugged and functional design that inspires wanderlust and enables active lifestyles. The 2020 Outback projects a large presence from thicker profile panel surfaces and raised rear gate as well as a sense of speed from its dynamic silhouette. Wider fenders, large hexagonal grille, front cladding and LED fog lights on the corners (standard on all trims except Base) emphasize the SUV’s capability. Cladding on the side of the Outback is meant to resemble a hiking boot that further enhances this concept. SUBARU STARLINK In-Vehicle Technology offers an integrated cockpit experience by allowing the driver to control entertainment and vehicle settings through a large touchscreen display. All STARLINK multimedia systems for the 2020 Outback feature a high-resolution touchscreen; new on- screen controls for audio, HVAC, X-MODE and vehicle features; combination meter integration; smartphone integration with Apple CarPlayTM, AndroidTM Auto and new STARLINK SmartDeviceLinkTM apps; Bluetooth® hands-free phone and audio streaming connectivity; AM/FM stereo; Rear Vision Camera; SiriusXM® All Access Radio (4-month free subscription) and SiriusXM Travel Link® (3-year free subscription); HD Radio® and over-the-air updates. Front and center, and highlighting Outback’s upscale interior, is an all-new tablet-style 11.6-inch Full HD multimedia display, the largest, most advanced infotainment screen ever in a Subaru. Standard on all but the Base trim, the 11.6-inch Multimedia display offers direct touch controls for multimedia, HVAC, X-MODE and vehicle settings, and includes Near Field Communication to its list of features. Like with a smartphone, app icons can be moved and configured based on personal preference. The 2020 Outback will be the first vehicle to offer the new Chimani app, which provides a comprehensive guide to all 417 national parks in the U.S. and includes park history and highlights written by local traveler experts. The top-of-the-line 11.6-inch Multimedia with Navigation adds navigation powered by TomTom® and voice activated navigation. For the first time in Outback, available in-vehicle Wi-Fi hotspot provides smooth internet access via high-speed LTETM communications. Framing the large multimedia screen is a new multilayer instrument panel featuring a soft-touch wrapped surface with available real double-stitching for a high-quality appearance. The wrapped surface material and stitching employ the same color combination as the seats and door trim for a uniform look and feel. An available 12-speaker Harman Kardon® audio system, with Clari-FiTM compressed audio restoration technology and GreenEdgeTM high-efficiency speakers and amplifier, delivers premium sound. Pricing for the 2020 Outback will be announced closer to this fall’s on-sale date.